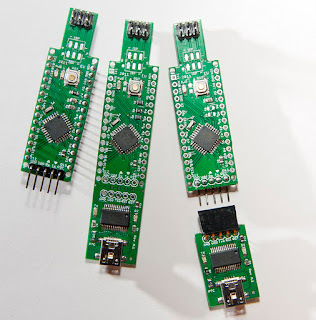 The arduSTICK is a small compact breadboard-friendly board based on the ATmega328P. It has the same functionality and pin-out asthe Arduino Nano but the USB interface can be detached from the board to suit application needs that need no permanent USB serial connectivity, thus making it a very cost effective and versatile solution. It has an internal voltage regulator, and works with a Mini-B USB. The board is fully compatible with the Arduino software development environment. An pin to pin compatible with the Arduino Nano. An additional filter stage has been added to the power supply of the AVR to improve analog readings and overall performance. bare board - only the bare board will be sent. no USB - an assemble Main Board without the USB components without header pin connectors apart from the ISP. fully assembled arduSTICK - a fully assembled arduStick with no header pin connectors apart from the ISP.